Design advantage: A.G. Rao, a professor of industrial design at IIT Bombay, with his creations. 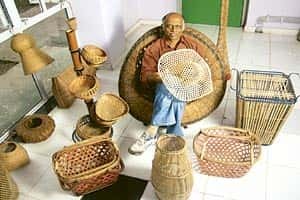 A chance encounter with a bunch of bamboo baskets and the merchants who sell them 30 years ago changed the course of A.G. Rao’s life and work. On a visit to what was then part of Bihar, the Indian Institute of Technology, Bombay (IIT-B), professor was impressed with the shape and design: “tetrahedronal", with three curved triangular sides and triangular base. “The design of the basket is very modern even by today’s standards," says Rao, a professor of industrial design. “To think I bought this for only Rs1.60." The incident set Rao thinking on what he could do for these craftsmen. About a decade ago, the opportunity arose as the Khadi and Village Industries Commission approached IIT-B to develop technologies to help artisans produce contemporary bamboo products that could compete in the urban and international markets. An estimated 1.3 million people are involved in bamboo crafts in various pockets of the country, such as the NorthEast, Kerala and Gujarat. With an annual yield of four million tonnes, India is also the second largest producer of bamboo, after China. Despite that, the country still trails countries such as the Philippines and Malaysia in exploiting this material and catering to the growing demand for products made of eco-friendly material. Rao sees his enterprise as playing a small part in boosting this art form. Innovation, he says, will be the key. “If we don’t intervene now, the craft will die," Rao says. Initially, Rao and his team began dissecting the artisans’ woes: the lack of tools; the inability to maintain uniformity in quality, dimensions or designs of products; a lack of knowledge on prolonging the life of bamboo and its products. Collectively, these issues added up to the artisans’ inability to sustain their enterprises—and livelihood. In response, the IIT-B group designed special tool kits with nearly 100 product-specific hand tools to process bamboo. Then they developed small hand-operated machines for bamboo processing, suitable for remote areas with unreliable power supply. They even taught the craftsmen how to treat bamboo to prevent fungal and insect attacks, and give the bamboo various surface finishes using natural dyes. “Artisans of our region benefited significantly from the association with IIT-B’s faculty," says Surendranath C., president of Uravu, a non-profit that works with 200 bamboo artisans in the Wyanad district of Kerala. Crafts involve a lot of trial and error but Rao has helped minimize errors considerably, he says. The artisans at Wyanad were among the first to receive the tools, along with other equipment and technology, to process bamboo. Due to these efforts, productivity has increased, as has their income. “Earlier, the artisans would earn about Rs60 per day. And now sometimes they even earn Rs120 per day," says Surendranath. Still, overall, the plight of the artisans did not improve much as they lacked an efficient marketing and distribution set-up and incomes were not steady. To address this, Rao recently started his own venture, called AG Bambustyle Pvt. Ltd, at IIT-B’s start-up incubator, with an investment of Rs5 lakh as well as some additional funds he raised. At a design centre on the verdant 100-acre IIT-B campus, his endeavours are evident in the bamboo products everywhere. Apart from lamps, hats and baskets lying around the room, there are pen stands made of bamboo, the dustbin is also made of bamboo and so are the coasters on Rao’s table. Even the pen in Rao’s shirt pocket is made of bamboo. With a few craftsmen working full-time and the occasional student pitching in, engineering brains melded with artisan’s skills appear to have yielded some unique products, such as a bamboo clock, a distinctive cell-phone holder and educational toys. Rao’s venture will focus on designing new products, creating prototypes, obtaining the raw material from the craftsmen and assembling the final products. The hope is that these products can command a premium at retail stores. Among the innovative products that he is most enthused about are educational toys, which he believes is likely to have a big market and may provide the solution to the marketing problems plaguing these craftsmen. Made of simple cut bamboo sticks and corrugated paper, these kits, which allow children to learn geometric concepts by creating structures in three dimensions, are easy to produce. They were recently tested in a series of workshops for children conducted by the Pomegranate Workshop, an organization that focuses on developing creative thinking in children. The children were soon building things as diverse as cameras and barbecue sets. “This makes the child think laterally, which is very important for innovation. From an educational point of view, the value this exercise brings is immeasurable," says Priya Srinivasan, founder of the Pomengranate Workshop. Srinivasan points out that the current school education provides little exposure to three-dimensional structures. “How can a child who is taught to think in 2D even perceive the double helix structure of DNA, which is three-dimensional?" she asks. Back at the design centre at IIT, work is in progress to develop a new game that will help children learn how to measure perimeters, the border of a geometric structure, in a fun way. Again, the prototype is largely made of bamboo. Once it is designed, Rao will start procuring the bamboo components of the kit from various artisans around the country and assemble the kit at his facility. “It does not take much skill to produce these products and it can be quite a profitable product for the craftsmen," he says.